The Nova Scotia Environmental Network (NSEN), which provides support to grassroots environmental groups across the province, is out its $18,000 allotment in federal funding as of an October 13 announcement by Environment Canada. 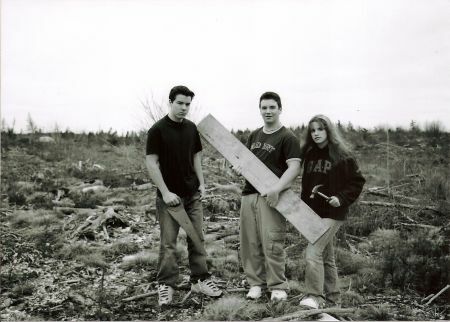 Pictured here: A group of teens visits a clear cut on the Eastern Shore of Nova Scotia in 2003 as part of the Standing Tall campaign, a project of the Ecology Action Centre, an NSEN member group. Photo by Rochelle Owen. 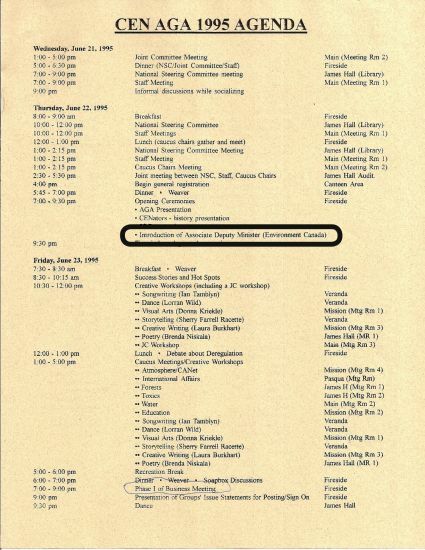 RCEN's 1997 national newsletter. 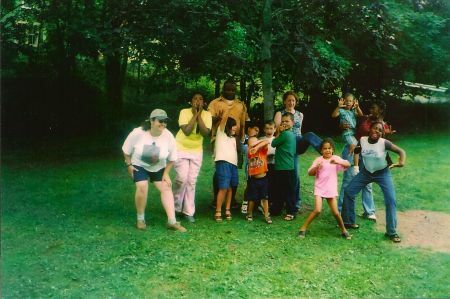 (Reseau) Canadian Environmental Network (RCEN) was founded in 1977 to promote the work of grassroots environmental groups across Canada. The national network had its entire core operating budget cut last Thursday. 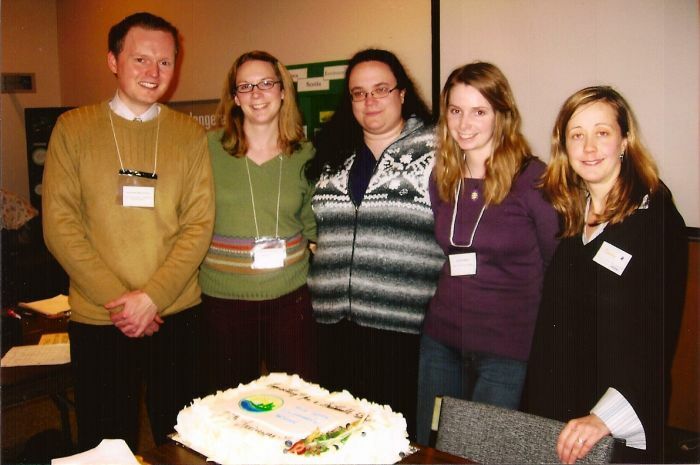 Environment Canada officials were on hand to dialogue with RCEN members--often small, volunteer environmental groups--at the network's AGMs until 2006. In 2006 Harper's Conservatives formed the federal government. 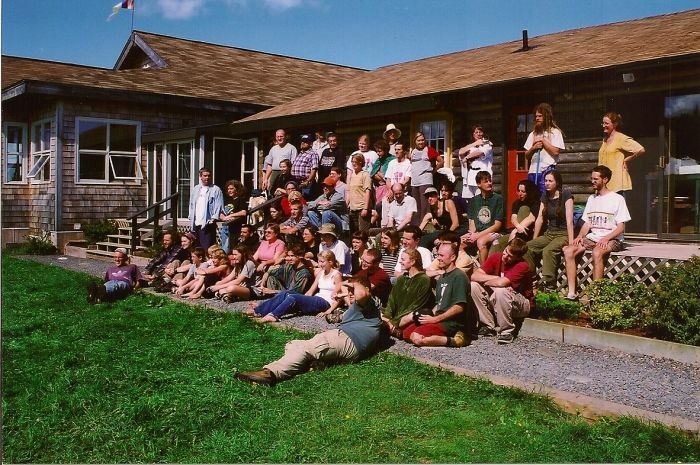 NSEN's 1999 Annual Fall Gathering (AFG) at Dorje Denma Ling in Tatamagouche. "NSEN helps us avoid duplication, collaborate on skill-building and give collective feedback on key policy decisions," said Clean Nova Scotia's Gina Patterson at a press conference in Halifax on Wednesday. Jim Dresher, sustainable woodlot operator, discusses forestry with Nova Scotia's Minister of the Environment Sterling Belliveau in 2009. The minister spoke at NSEN's 2009 AFG, held at Dresher's Windhorse Farm. A 1999 letter from the Department of the Environment to NSEN. 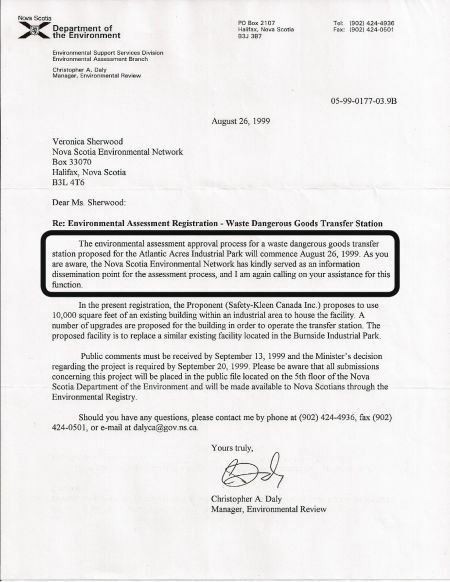 "As you are aware, the Nova Scotia Environmental Network has kindly served as an information dissemination point for the assessment process [for a waste dangerous goods transfer station], and I am again calling on your assistance for this function." NSEN's 1996 AGM minutes. Item #7 addresses the consultations done in partnership with the Department of the Environment. RCEN and its provincial networks are the mechanism through which federally-legislated public consultations are held, and until 2006, the network was provided with government funding to carry out these government-mandated consultations. 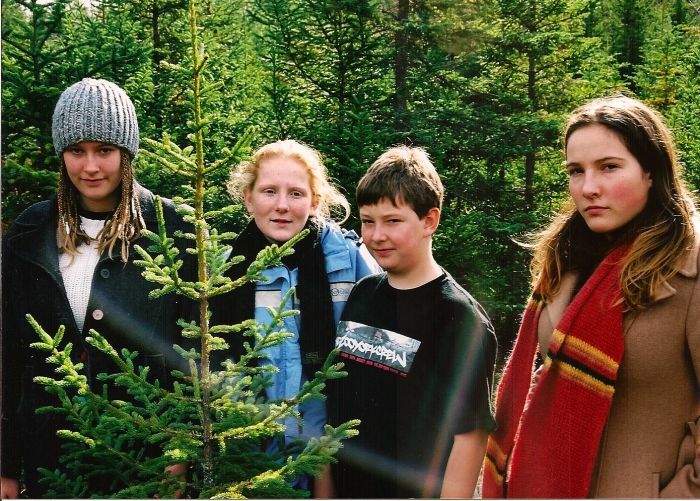 Environmental education is one of NSEN's priorities, including offering workshops to young people, such as the 2004 Youth Entrepreneur Group in Lucasville, Hammonds Plains and Sackville, NS. A meeting of NSEN's Water Caucus. 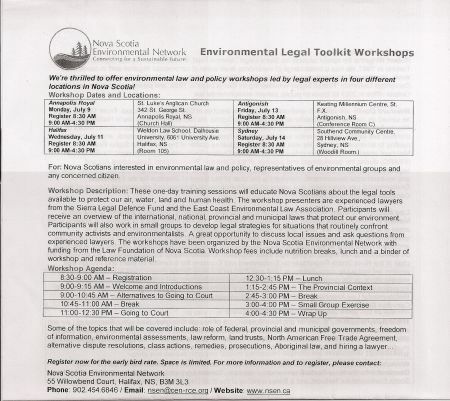 NSEN's mandate is to provide education and networking opportunities to groups in the environmental sector across Nova Scotia. 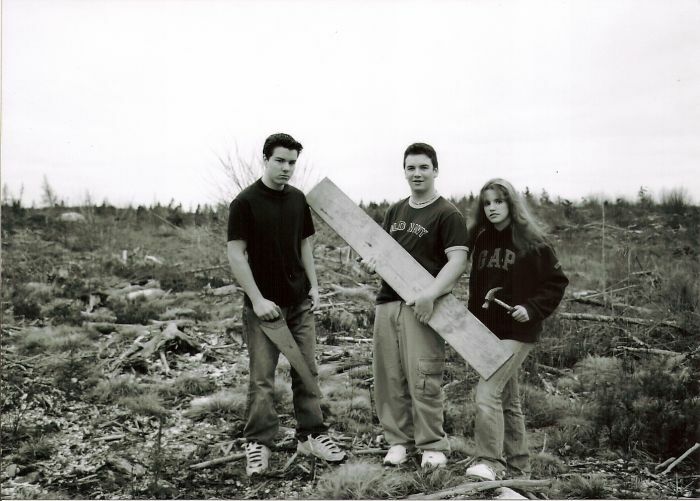 The Youth Environmental Group visits a clear cut in Ship Harbour with the Standing Tall campaign. NSEN's Legal Toolkit. NSEN provides training opportunities for the environmental sector in media, fundraising, facilitating and law, at a fraction of the cost of industry services. 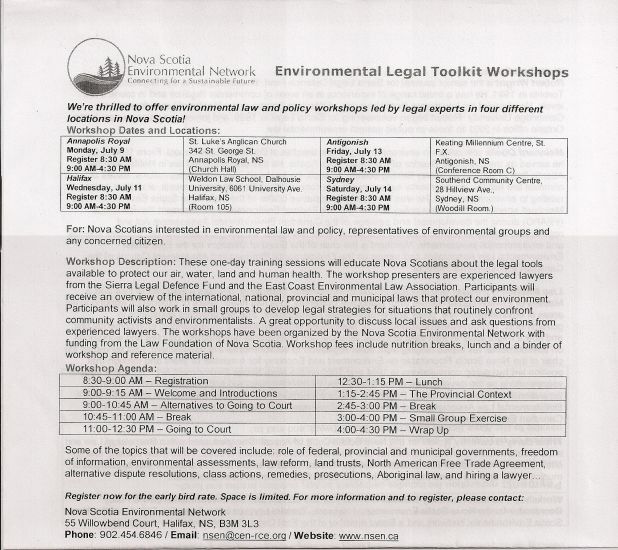 East Coast Environmental Law was created from this Legal Toolkit. 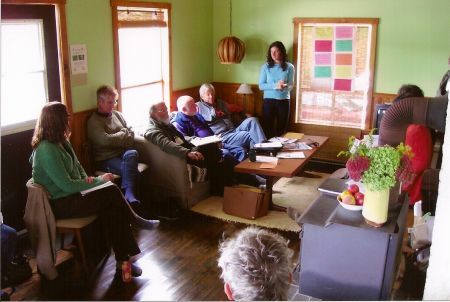 Partnering with grassroots groups like the Tusket River Environmental Protection Association, NSEN provides a provincial forum for and resource-sharing with locally-based environmental struggles. NSEN's 15th anniversary in 2007 also marked its inaugural Eco-Hero awards ceremony. Five Eco-Heroes were created to recognize individuals and groups who contribute to environmentalism in Nova Scotia. Photographed here, left to right: Alex MacDonald (Nature Nova Scotia), Janelle Frail (Canadian Parks and Wilderness Society), Emma Boardman (Ecology Action Centre), Emily MacMillan (Sierra Club Atlantic), Tamara Lorincz (Executive Director, NSEN). Nova Scotia's Ecology Action Centre and BC's Sierra Club were each cut out of long-time federally funded environmental projects in 2007. 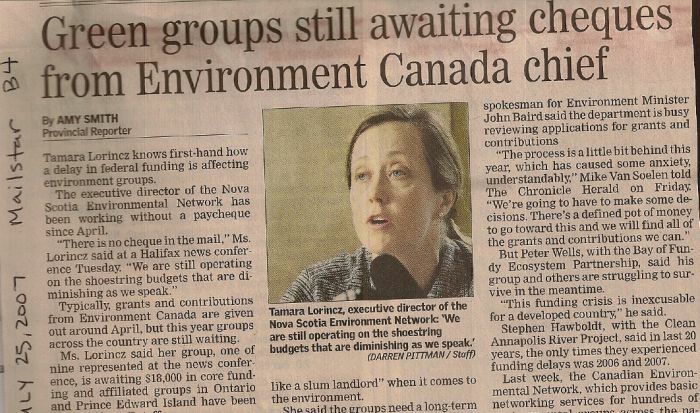 The review process of the projects was questionable, as outlined in this Chronicle Herald article of September, 2007. "There's been a slow death to Environment Canada's programs," said St. Mary's professor and head of the Community-Based Environmental Monitoring Network Cathy Conrad in 2007, when $10 million was cut from Environment Canada. A local climate change monitoring network, in which scientists and residents analyzed environmental data, had its budget slashed by 80 per cent, on top of a 34 per cent cut the year previous--the year Harper's Conservatives came to power. 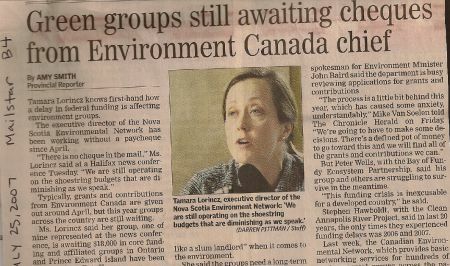 2006 and 2007 were the first years that Environment Canada delayed funding to the Canadian Environmental Network, as noted by several Nova Scotian environmentalists in this 2007 article. The delays became habit, and finally this October, a six-month delay turned into a funding termination. Grassroots environmental groups and organizers were hit hard by last Thursday's federal announcement that the half-million dollars that funds Canada's environmental networks would be terminated. For people like Katherine Gagne of Gays River, NS, this means the opportunities she has had to engage with the province of Nova Scotia about the lead and zinc mine in her village have disappeared. But speaking at a press conference in Halifax on Wednesday, Gagne argued that the biggest loser in this deal is government. "For this tiny amount of money, Environment Canada is shooting itself in the foot," she said, explaining that paid bureaucrats are obligated to use taxpayers' resources to respond to all citizens' correspondence and concerns. 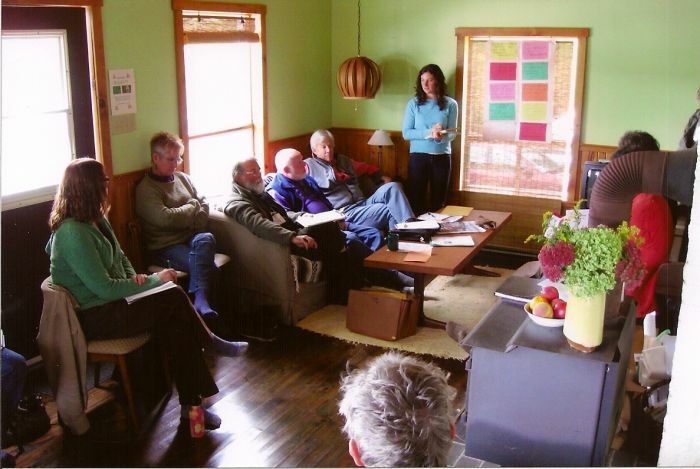 "NSEN [Nova Scotia Environmental Network] has shown us how to approach government and community in an intelligent way." Gagne said that with support from NSEN, she and her neighbours formed the Gay's River Valley Environmental Protection Association, and have been working to ensure the lead and zinc mine operates strictly within regulations of the Departments of Natural Resources and the Environment. "A lot of people like me want to get involved, but we need some kind of structure to help form the relationships," she said. 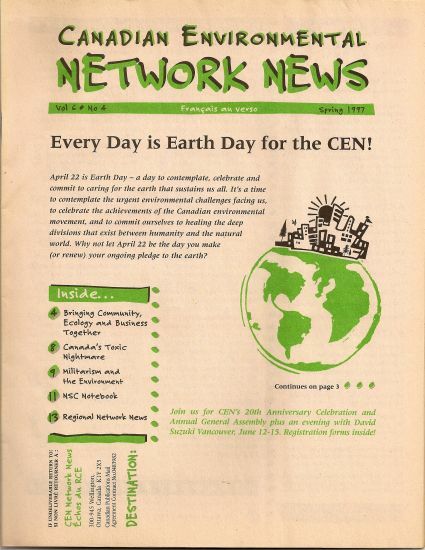 The (Reseau) Canadian Environmental Network (RCEN) was established in 1977 to promote and streamline environmental work being done by grassroots organizations and to provide Canadians working on the ground a platform for engagement with Environment Canada and their provincial departments. In fact, RCEN plays a critical role in democratic policy-building in Canada, functioning as the formalized mechanism for federally-legislated stakeholder consultations on environmental policy and projects; "meaningful public participation" is called for in the Canadian Environmental Assessment Act. "Small and often volunteer organizations take part in these consultations," said Jennifer McGowan from the Ecology Action Centre, another NSEN member group. Through the RCEN, "the environmental community decides who best speaks to a particular consultation topic, through a transparent application process," she said. In this way, community-sourced, scientific, Indigenous and traditional knowledge is filtered to provincial and federal policy. "RCEN is not a special interest lobby group," said McGowan, who added, tongue-in-cheek, "This announcement only affects Canadians who breathe air and drink water and eat food." The cuts amount to $547,000--the entire core budget for the Ottawa office, the 10 provincial networks and the Yukon network. Nova Scotia's allotment--based on population--would have been $18,000. In an October 13 letter to RECN, Environment Canada's Nancy Roberts wrote that the decision to cut RCEN's funding "reflects a broader shift away from providing core organizational funding...as part of Environment Canada's ongoing efforts to allocate its resources in the most efficient and cost-effective manner possible." The panelists at Wednesday's press conference weren't buying that. "The knowledge, resources and expertise amassed by 647 environmental groups over 34 years is priceless--you can't buy it," said NSEN Advisor Sheila Cole. "This is the best possible value Environment Canada could ever find." RCEN member groups represent some 630,000 active individuals. Ninety-eight per cent of the work done in the networks is voluntary. According to a study last year by Phoenix Youth Progams, investing in non-profit organizations is extremely efficient use of public dollars because the calibre of workers is so high--three-quarters of people employed by non-profits in Nova Scotia hold at least one university degree. The study found that non-profits provide services at a cheaper rate than government or industry. "Those of us who work in the environmental sector are part of a very real and necessary industry...one of research and development," said Fred Blois of Biosolids Free Nova Scotia. "If there's any department that needs research and development, this is it." "Many of us are experts in our field," added Allister Marshall of the Pot'lo'tek Fish and Wildlife Association. Janelle Frail, director of Nova Scotia's network, may not have her job come January, when NSEN's bank account runs dry. However, she agrees that the environment sector cuts leave the government itself the most serious casualty. "Our annual meeting with the province is hugely beneficial to them: instead of having to organize 60 meetings, they have one," she said. NSEN, which celebrated its 20th anniversary this year, works with 62 grassroots environmental groups in Nova Scotia. "We get info out [to member organizations] about what the Department [of Environment] is doing; we help interpret policy. A good example is the recent Environment Act review. We got members together--some were more proficient with the legal language and they helped others understand it." "We were very disappointed to hear of Environment Canada's decision to no longer fund this important work," wrote Nova Scotia Minister of the Environment Sterling Belliveau in an email. "I have written a letter to Minister Kent, asking him to reconsider this decision." 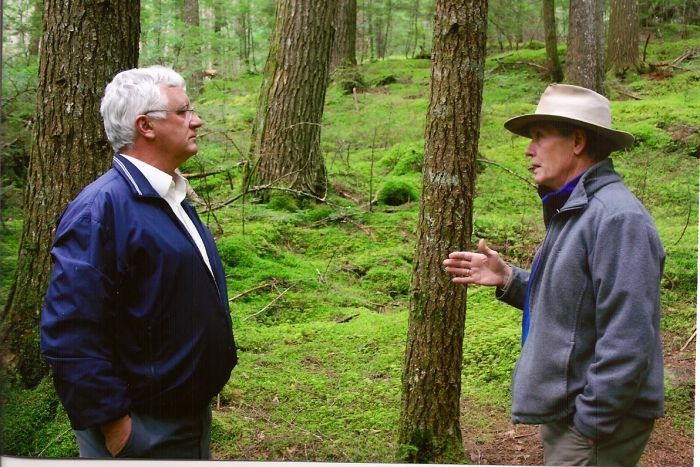 "The province is coming to appreciate our work because they know they won't reach the full potential of a 'cleaner, greener, more prosperous Nova Scotia' without us," said Cole, quoting Belliveau in Nova Scotia's Water Resource Management Strategy. "We have done the lion's share of environmental education in communities across the province." In each of the past two years, Nova Scotia contributed $10,000 in annual core funding to NSEN. Halifax city councillors Peter Lund and Jennifer Watts announced they had just passed a resolution through City Hall to send a letter on behalf of Halifax Regional Municipality to Environment Canada, asking the department to reverse the cuts. "The letter will be copied to [Premier Darrell] Dexter, Belliveau, [Federal Minister of the Environment Peter] Kent and the office of the Prime Minister," said Lund. "We hope the FCM [Federation of Canadian Municipalities] will get involved in this." "'Austerity measures' is code for 'spending priorities,'" said Angela Giles of the Council of Canadians, pointing out that these priorities were playing out the very day of the NSEN-organized press conference. While the panel addressed the Harper government's $547,000 cutback to grassroots environmental work across the country, Premier Dexter was at the Halifax shipyards to congratulate Irving on its $25 billion dollar federal shipbuilding contract win. Media attention was painfully absent (this volunteer reporter was the sole media person at the press conference). And the announcement that cut $18,000 from Nova Scotia's environmental communities also came the day after Dexter announced a $10 million provincial investment in aerospace and defence jobs in Nova Scotia. Meanwhile, Occupy Nova Scotia was in its fifth day of protest over corporate control of government. In an interview after the conference, Frail explained how the networks have been stretched thin over time. "Prior to 2006, RCEN received about $1 million. A half-million was to fund consultations, the other half was to run the networks. The consultations are still happening, but they're piecemeal: networks have to apply for grants as they come along," she said, explaining that this puts further strain on staff and volunteers to seek out and apply for monies that used to be provided in one chunk. "For 30 years, the federal Minister of the Environment came to our AGMs...and there was lots of time to engage with our members," said Cole. "Only since the current majority Conservative government does the minister not come to our meetings, or even answer our calls." "In any other sector, if that minister did not speak to their constituents... Can you imagine if the Department of Fisheries and Oceans didn't speak to fishermen's associations, or if the Department of Agriculture refused to return farmers' phone calls?" said McGowan. "It's mindblowing." "Year after year we have sat at the table with industry," said Cole, describing RCEN's internationally-reknowned Multi-Stakeholder Decision-Making process, whereby government, academics, scientists and environmentalists cultivated relationships with Nova Scotia's paintings & coatings industry. "There are very good people in the industry, and they were seeing the opportunities in manufacturing environmentally friendly products," said Cole, explaining NSEN's work in volatile and organic compounds which helped "put good paints on the shelves in Nova Scotia. "Canada was at a point internationally to take the lead in green industry--without the greenwashing. Now, Canada has a horrific reputation," she said, citing Canada's international campaigns to rebrand oil from the tar sands "Ethical Oil." Young professionals, lawyers, students, scientists and faith groups such as the Interfaith Coalition for Climate Justice and the United Church Maritime Conference Environmental Working Group have added to the chorus of voices protesting the cuts. "Nature Nova Scotia wishes to express shock and regret over the recent announcement," wrote Bob Bancroft, celebrated Nova Scotian biologist, in a letter of support to NSEN. "This is a broken promise, Mr. Kent." The promise was a letter of intent, sent by Environment Canada to RCEN in August, which stated that RCEN's funding was coming. 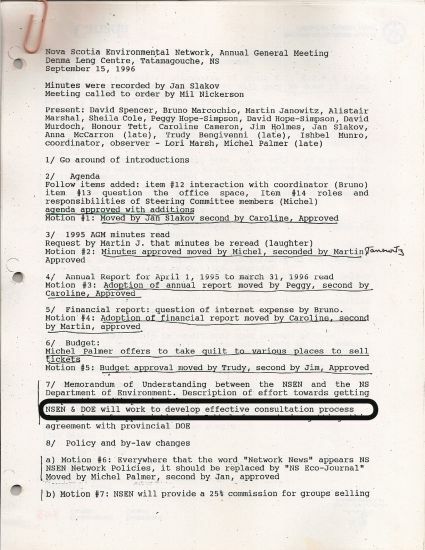 The funds, promised in August, and which never came, was to run the networks--including paying staff--for the 2011 fiscal year. RCEN announced on October 13 that its staff would be laid off as of the following day. 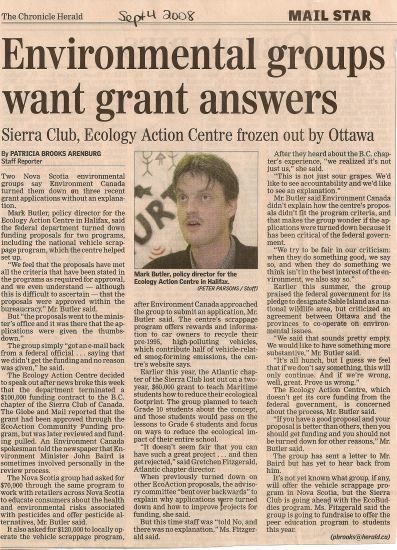 "Networks have been paying staff from their bank accounts for the past six months, assuming they'd be back-paid," said Frail, who also said Environment Canada's practice of delaying funding to RCEN was nothing new. "I once worked for four months without getting paid." She said that, over the year as federal funding continued to be delayed, she cut her hours from 30 per week to 20 to 10. Now, she is unsure what will happen to NSEN, or to her work within the network. "Everything is on pause--what should I continue to do? Should our rep continue to be part of the Nova Scotia Water Advisory Group? Will I continue to sit on the Minister's Roundtable on Environment and Sustainable Prosperity?" she said. "And remember, this is being repeated 11 times over--in 10 provinces and one territory." Newfoundland & Labrador, New Brunswick and Manitoba are the only three networks that have confirmed they have enough cash to stay active until March 2012. Cutting out the Canada's environmental networks evokes a grim image of a "disjointed, disengaged and alienated" environmental community, according to Gina Patterson of Clean Nova Scotia. "They're saying there's a shift to web-based consultations. Does this mean that corporations and politicians will also be shifted to web-based consultations?" said McGowan. "Or will they still be at the table while small environmental organizations are plugging away at their computers?" Frail agrees. "For me, the worst part is that the government is going to cherry-pick who can sit at the decision-making table, instead of us deciding who sits at the table." Who really are the big losers here? Submitted by Reid Barclay (not verified) on Thu, 10/27/2011 - 15:17. Yes I agree the gov't is going to lose money in the long run from this ill advised plan, but are not the Canadian citizens going to lose by way of projects going forward with insufficient environmental safeguards in place, because someone forgot to include them into the operating terms and conditions, or insufficient monitoring.? Don't forget for a second that big business s behind all this, if it saves them some $$$. Cumulative effects,be dammed. Submitted by Moira Peters on Fri, 10/28/2011 - 14:12. Playing on the irony that the Environment Canada is cutting off its nose to spite its face in this move, I was hoping to refer to "government" in the oldest sense--when the Canadian government loses, it's the people of Canada losing. Submitted by danieltowsey on Sat, 10/29/2011 - 01:54. The gov does not care about us or the environment..Harper makes me sick..